When the opposition barrels towards you and the game seems surely lost, there’s only one person you want on your side: Jemma Ballantyne. Jemma is one of the most sought-after defenders in the National Premier League. At only fourteen years old, UQFC’s blonde firebrand has been selected to don the maroon Queensland jersey for a third time. “I love representing my state” she beams, juggling the ball. Jemma is ready to represent her state at the highest level. In February this year, they went down 3-1 to the Aussies in an Olympic qualifying thriller. The University of Queensland FC star is currently playing her seventh year of competitive football. At the most recent State Football Trials, she was named Metropolitan West player of the tournament. However, there’s more to this speedster than meets the eye; she is also a high-achieving student with a passion for learning. 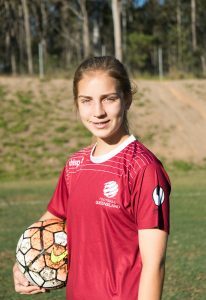 Playing for UQFC has given her some insight into a future outside of football “I try really hard to balance my studies because I would like to go to uni in the future”. Despite training up to four days per week and attending development clinics, she still finds time to be a regular teenager “I love my friends and family and spending time with them”. With a stunning record and a bright future, the maroon-clad Jemma is one to look out for.